﻿This is all I'm doing today. 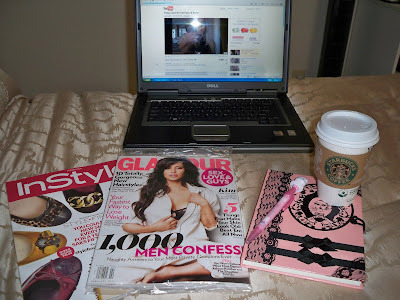 Catching up on blogs and YouTube, reading the new issues of my favorite magazines, sipping my white chocolate mocha, and writing in my notebook. I hope those of you who also have the day off are doing something you enjoy, and having your favorite day. Sounds like such a perfect relaxing day. I wish I had the day off. Lilly: Well even tho you don't have the day off, I hope you are still having a good one! Katie: Awww, I miss those days. I love days like that! Today I did something similar I stupidly ventured out into the blizzard, slid around in my car and came back home to be safe and warm and watch old episodes of LOST over again and remember what it was like to be in college without a care in the world when LOST was new haha. This sounds like absolute perfection! Have a fabulous day, gorgeous! Hope you had a great day! I love that notebook! I love those kind of days! :] enjoy! Sounds like a perfect day of girly relaxing! Doesn't get much better then that! That's my kind of day girly. Enjoy it! Can you believe a beauty editor does that all day long. What a life they have. Oh, I have to get that Instyle! Seeing all those shoes makes me giddy! I just finished that Glamour! I loved the photos of Kim. She looked gorgeous. Sounds like the perfect kind of day to me!! Hahaha! That's my idea of the perfect day. 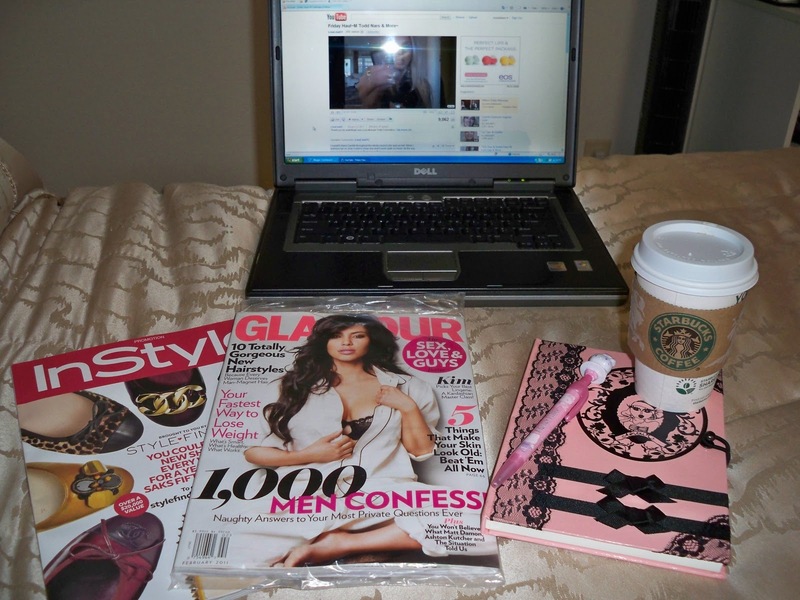 Staying in bed with some magazines, my laptop, and some Starbucks! Great blog! Thanks for the motivating words sweetie. I am going to go for my dreams. Your a baby still, get to know who you are inside first then discovering your dream will follow. Enjoy life, the rest will fall into place. Diary of a short girl: Thank you! E: Awww, thank you! I feel old, even though I know I'm not. We are always so hard on ourselves aren't we? LOVE! Do you have a favoirte fashion magazine? I currently only subscribe to Oxygen, a fitness mag and I am looking to subscribe to a fashion mag as well.